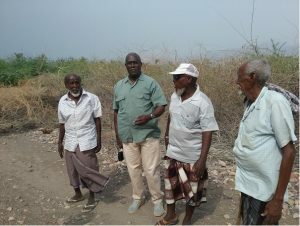 Academics, leading research institutions on food security and environmental governance, CSOs, community members and key representatives of government institutions from Djibouti, Ethiopia, Kenya, Somaliland, South Sudan and the Sudan convened in the Gulf of Tadjoura, Djibouti, from August 25 to 28, 2017 to discuss and agree on a coordinated response to the devastating impacts of invasive Prosopis species in the Horn of Africa (HoA). 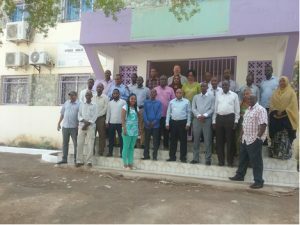 The workshop was organised by the Horn of Africa Climate Change programme (HoA-CCP) funded by the Ministry of Foreign Affairs (DGIS), the Netherlands, and coordinated by the Horn of Africa Regional Environment Centre and Network (HoA-REC&N). The implementing organizations are the civil society organisations and academic institutions from the six countries in the HoA. The programme focuses on promoting landscape restoration, food security and reducing green house gas emissions by promoting renewable energy and green infrastructure development. 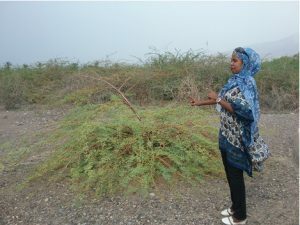 Prosopis plant and other invasive alien species were introduced in the Horn of Africa, and elsewhere, during the last century. Some international organisations promoted the establishment of plantations, especially Prosopis species across the continent to combat desertification. Since then they invaded large areas to the detriment of biodiversity, wildlife, water resources, rangelands, and livelihoods. In the Horn of Africa, there has been an exponential increase in the distribution of invasive alien plants over the last 20 years, contributing to the abandonment of land, driving conflicts and mass migration to other countries including the west. In addition, some invasive alien plant species may actually be contributing to an increase in the prevalence of diseases such as malaria, rift valley fever and leishmaniasis. It is estimated that about one-third of the HoA is already invaded and that potentially two-third of the region could be invaded to the detriment of farmlands, rangelands and water catchments with huge implications on food security and livelihoods if management interventions are not developed and implemented as a matter of urgency. The workshop participants agreed that an integrated management is required, including bio-control, and that utilization as management strategy on its own is ineffective and may in fact contribute to the spread of the species. The call for a coordinated approach to address this issue in the Horn Africa is more urgent than ever. Support local efforts, as an immediate measure, to start removing isolated species of Prosopis species across landscapes to minimize further widespread spatial infestations. The Horn of Africa Regional Environment Centre and Network (HoA-REC&N) was formed in 2006 with the aim of uniting academia and endogenous organisations from the Horn of Africa countries to promote environmental conservation and natural resource management across the Horn of Africa. HoA-REC&N facilitates, strengthens and advocates for sustainable development and better environmental governance across the Horn of Africa.